This is pretty good news. I've had the 'pleasure' of working with a number of integration project where the 3rd party was still using iso-8859-1 (aka latin-1). Usually when this is the case, its not by choice but because of their software's default settings (Browsers, MySQL, etc.). I for one hope non-unicode charsets will soon be a thing of the past. One other note in the post was about ligatures, such as ﬁ and the dutch ĳ. If this is the first time you heard about these, you might be surprised to see that you can (likely) only copy-paste ĳ as a whole, and not just the i or j. 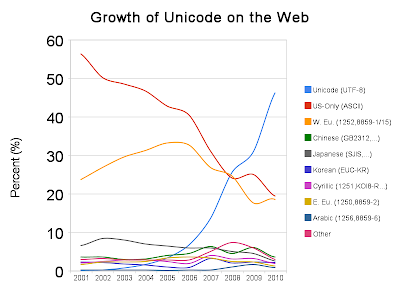 It's one unicode character, not two. It just made me wonder: what kind of software would generate these, and more importantly why? "It just made me wonder: what kind of software would generate these, and more importantly why?" Well, the answer is right there in the post you referenced, it just looks better in documents intended for printing: "[...] especially generated PDF documents." Let the battle and competition rage. @Dave, Maybe I'm crazy, but shouldn't it be a job of the font to make a combination of 2 characters look better? And of course this means that PHP 6 is becoming more important with each day. But is it in sight?